Removing a package from a Distribution Point through the console is pretty easy, you would just go in the package properties and under content location you can select the Distribution Point and Remove the package from it. What if you want to start clean and remove all failed packages from the Distribution Point? I put together a quick powershell script that will remove all failed packages from the distribution point/points. The script will firstly gather all packages in a Failed Distribution state, and then it’ll go through each one of them and delete it from the DP that shows it as failed. $pkgs = Get-WmiObject -Namespace "root\SMS\Site_$($SiteCode)" -Query "Select * From SMS_PackageStatusDistPointsSummarizer Where State = 2 OR state = 3"
$dps = Get-WmiObject -Namespace "root\SMS\Site_$($SiteCode)" -Query "Select * From SMS_DistributionPoint WHERE SiteCode='$($pkg.SiteCode)' AND PackageID='$($pkg.PackageID)'"
I think that mounting a physical disk or external disk to a VM in Hyper-V is really interesting, especially if you’re looking to attach a USB stick or an external HDD to a virtual machine. The operation is very simple but I suggest you not to abuse it: mounting a disk through a USB port will result in getting a pretty slow data transfer, but at the same time it’ll result in instant data-portability. So, in order to do that we just need to mark the disk as inactive. Open a command prompt and type the following. Now note the disk number you want to attach to the virtual machine, let’s say it’s number 3. You may now exist disk part and go in Hyper-V and attach a new disk to the virtual machine. In the screenshot below I attached it as an iSCSI controller. 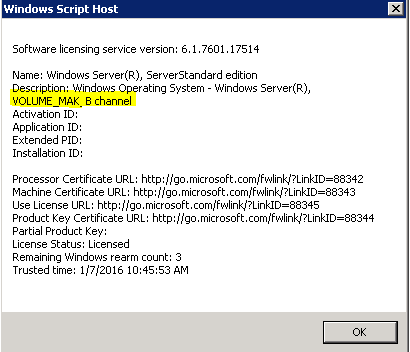 If you’re interested to check what type of Windows License is installed on a machine (either Client or Server – From Windows 7/Server 2008), launch a command prompt with administrator rights and run the following command. As you can see, this is a Volume Licensing MAK type (Multiple Activation Keys). The reason why I was looking for such information is because one of our servers died and we didn’t know whether we had it activated through our KMS server or through Microsoft. Since I knew a similar server in the environment [I mean a server that had the same license type purchased and installed at the same time] I just checked what was the license type so that I could apply the same type to the server we were rebuilding. You can see it states it to be a VOLUME_KMSCLIENT type. Copy “C:\Program Files (x86)\FileZilla Server\FileZilla Server.xml” from the original FileZilla Server (so the settings you want to copy from). Stop FileZilla Server’s service on the destination server. Make a copy of the current config file [C:\Program Files (x86)\FileZilla Server\FileZilla Server.xml] (name it so that you know it’s the previous configuration). Paste the FileZilla Server config file that you have copied on Step #1 in “C:\Program Files (x86)\FileZilla Server”. Start FileZilla Server’s service on the destination server. Note: if you’re running a 32bit version of Windows, then the path would be “C:\Program Files\FileZilla Server”. When I had to transfer FileZilla Server settings across two servers, I didn’t stop the service and it didn’t work (even after restarting the service afterwards) that is why I’m suggesting you to stop the service prior copying the new config file over.